The River Church: What Does Mold Have to Do With the Bible? What Does Mold Have to Do With the Bible? Have you wondered what is taking so long, why it is that some two months after the flood, we are still not quite ready to put the church building back together? Why have we spent so much time and effort tearing it apart? The problem is invisible, at least at first. 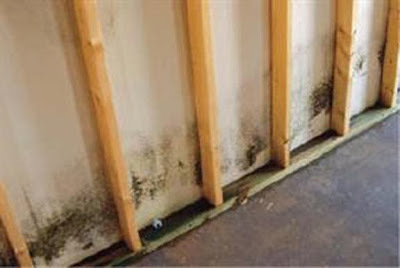 Mold grows invisibly, making people sick, and eventually showing itself when so much damage has been done. We could have cleaned and cleaned the church building until you could eat off the floor, but until it has been thoroughly sprayed and treated for mold, it would still be in dangerous shape. Stripping away all the outside layers of drywall and decorative rock and flooring is just the first step. What we really need is spraying for mold. Just like sin. People get the idea that we can clean up our act by self-effort. People get the dangerous idea that if we just try harder to be good, if we just keep going to church and saying the prayers, we will be good enough. But sin, like mold, grows invisibly in places our own efforts will never be able to spot it in time. By the time we can see sin in our lives, it has already begun to do its damage. What we need is spraying – by the blood of Jesus Christ. How Does Jesus Show Up?